Hi everybody! 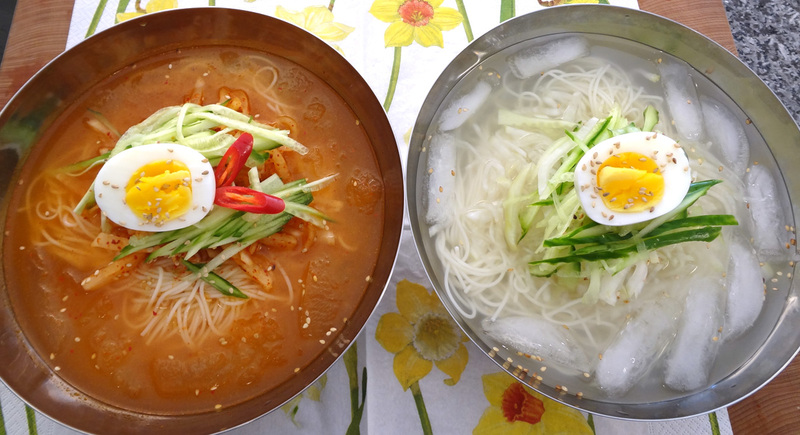 Here you go, dongchimi-guksu recipe is here! I know some of you are waiting for this recipe because I mentioned it in my previous video for dongchimi. Some of my readers have already showed me photos of their delicious-looking dongchimi, so they are well-prepared to make dongchimiguksu. This video has a spicy and non-spicy version, so there’s something for everyone. And if you’re a vegan or vegetarian who doesn’t eat eggs, skip the egg and enjoy your cold noodle soup! I ran out of my dongchimi a while ago, so when I edited this video today, I really wanted some. A spoonful of the broth, full of dongchimi flavor, stimulates my appetite every time. And all the crispy stuff on top – dongchimi strips and cucumber – is irresistible. On hot days, I never trust the quality or cleanliness of cold noodle soup in any restaurant. It’s always best at home when I know where all the ingredients come from, and can really be generous with the toppings. Ok, I just decided that I’m going to make this again, very soon! Enjoy the recipe, and let me know if you share your precious, delicious, cool soup with anyone! Mix the dongchimi broth, water, salt, sugar, vinegar, and kimchi juice in a bowl. Put in the freezer for 2-3 hours until slushy. Boil the noodles in a large pot for a few minutes. Rinse in cold water a couple of times and drain. Put the noodles in a large serving bowl. Pour the cold slushy broth over the noodles. Add radish, cucumber, and the halved hard-boiled egg. Sprinkle some toasted sesame seeds over top and serve immediately. Mix dongchimi broth, water, salt, sugar, and vinegar in a bowl. Put in the freezer for 2-3 hours until slushy. Posted on Friday, May 25th, 2012 at 7:39 pm. Last updated on August 7, 2017. Posted January 13th, 2019 at 3:25 pm | Log in to reply. I am about to eat this for lunch. Very excited. Posted February 27th, 2019 at 8:15 am | Log in to reply. Posted June 16th, 2018 at 3:42 pm | Log in to reply. Posted June 19th, 2018 at 8:08 am | Log in to reply. I used to live in Toronto! Let me know how your broth turns out! Posted June 30th, 2018 at 3:23 pm | Log in to reply. Posted July 11th, 2018 at 8:27 am | Log in to reply. Wow your dongchimi looks like mine, the dongchimi in my fridge now! I always make it in the summertime for naengmyeon broth. Posted May 13th, 2017 at 7:58 pm | Log in to reply. I will be going to Korea this summer for vacation and everything I’ve learned on your website has made me so much more excited than I would be otherwise! I can’t wait to eat endless Korean food <3 I cook at least one of your dishes every week! Posted September 26th, 2012 at 6:31 pm | Log in to reply. What exactly is “kimchi Juice?” Is it just the liquid that is with the kimchi when you make it? Or is it something else? Posted September 29th, 2012 at 2:20 pm | Log in to reply. When you first make kimchi, you won’t see much liquid. But 1 or 2 days later the water from the cabbage or radish will be be drawn out and mixed with the kimchi paste. That’s what I call “kimchi juice.” I know it’s a strange expression but I don’t know any other word for it. Posted July 29th, 2012 at 8:48 pm | Log in to reply. I made the non-spicy version tonight, using water kimchi I bought at Super H Mart. It was *so* delicious!!!!! This is my new favorite summer dish to order at Korean restaurants, but I’m even happier to be able to make it at home! Posted July 30th, 2012 at 7:37 am | Log in to reply. yeah, the cold broth is really refreshing and delicious on a hot summer day! Posted June 30th, 2012 at 8:16 pm | Log in to reply. Nice to meet you Mangchi. this is a fantastic website on korean recipes. Ï live in Korea. and I’m learning to make a dish for my family. Dongchimi guksu is one of my favorites. I’m a big fan of you Mangchi. and thanks for your knowhows. Posted July 30th, 2012 at 7:38 am | Log in to reply. Posted June 3rd, 2012 at 10:35 pm | Log in to reply. I’m so excited to have found your site! My family has always loved Korean food and my parents know how to make several dishes, and have passed the knowledge down to me, but it’s so cool that through your site I’m going to be able to expand on that! Do have a quick question, I went to start making kimchi and realized that my red pepper flakes aren’t where I thought they were and I can’t find them (have moved twice in 6 months so I have a feeling I’m not going to find it either). Not going to be able to get to the store that will carry them until tomorrow. I have already salted and washed my cabbage. Is there any specific way that I should store the cabbage until tomorrow when I can complete the process? Posted June 4th, 2012 at 4:10 am | Log in to reply. Wash the salty cabbage and drain water. And then keep it in the fridge until your kimchi paste is ready. It should be done in a few days though. Posted June 1st, 2012 at 3:50 pm | Log in to reply. Hi Maangchi, I tried your bean sprout side dish, cucumber kimchi, egg plant side dish, soft tofu soup and emergency kimchi so far. They were all super delicious!! Thank you! My Korean home stay student said that some of the dishes I made were more delicious than her mother’s cooking! Of course, I used your recipe, hahaha. :) Keep up your great work! Show us more dishes perfect for summer! Do you know more Korean style cold noodles? 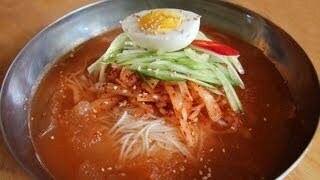 I love spicy Korean noodles!!! Thank you! Posted June 2nd, 2012 at 1:28 am | Log in to reply. I’m very happy to hear about your successful Korean cooking experience! Your students will love bibimguksu, too. 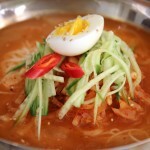 https://www.maangchi.com/photo/bibimguksu-spicy-mixed-noodles Check out more noodle recipes. Happy cooking! Posted June 1st, 2012 at 7:13 am | Log in to reply. Posted May 27th, 2012 at 2:20 am | Log in to reply. This looks amazing. I have watched around 20 of your videos in the past two days! My mom even watched some with me as well. I found out that you had a spring meet up last week. So sad I missed it :( Do you ever meet with your readers in NYC? Flushing has many delicious places to eat at. Posted May 26th, 2012 at 2:42 pm | Log in to reply. Hi Maangchi, I’ve got one question: what is that music in video? Posted May 26th, 2012 at 2:45 pm | Log in to reply. The title of the music is “noodlechimiya”. I made it using garageband. Posted May 26th, 2012 at 4:28 pm | Log in to reply. Posted May 26th, 2012 at 12:39 pm | Log in to reply. Posted May 26th, 2012 at 1:48 pm | Log in to reply. Posted May 25th, 2012 at 11:03 pm | Log in to reply. Wow, wonderful recipe! I used yeolmu kimchi instead of dongchimi because its all I had, but it was still super delicious! Who knew that a little extra vinegar and sugar could make the broth so much more refreshing! Posted May 26th, 2012 at 1:49 pm | Log in to reply. Posted May 25th, 2012 at 8:29 pm | Log in to reply. Wow, this looks so good! You used the same bowls from your naengmyeon video! Posted May 26th, 2012 at 1:50 pm | Log in to reply. Kerri, yes, I was thinking about you when I uploaded this video because you made dongchimi! This recipe was originally posted on May 25, 2012 at 7:39 pm by Maangchi. It was last updated on August 7, 2017. The video was watched 288,505 times on YouTube & has 2,554 likes!